After a fabulous trip to NY to visit friends in mid-November 2015 (See my first post on Spinning Addiction), I left with a newfound love for spinning yarn. I had learned on her Ashford Traditional wheel, which was fantastic, and was then sent home with a large bag of wool that just begged to be spun. 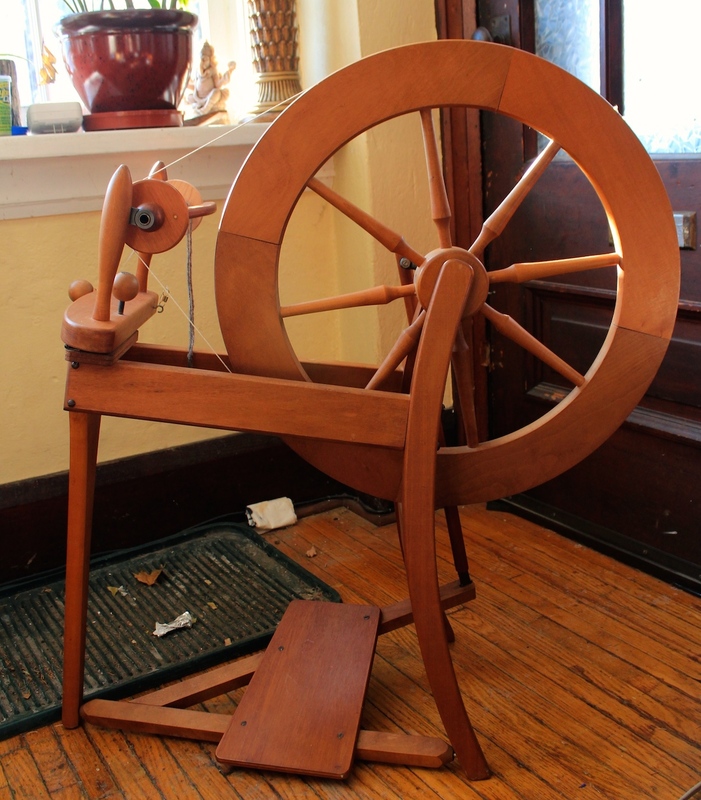 Thus began my hunt for a spinning wheel to call my own. I focused on used wheels in Ontario and began checking Kijiji and Craigslist on a daily basis. New wheels were a little expensive for a brand new hobby that was still percolating and hadn’t yet established itself solidly in my life. There were many wheels available but it was really difficult for a newbie like me to decide from a picture, usually grainy and discoloured, whether a certain wheel looked functional and worth my time. It was even harder when a seller said “my wheel looks like the one in the picture” without sharing an *actual* picture of the wheel for sale. So I did more research. I read articles on spinning and wheel brands. What type of problems were common with older wheels, what bits to check when in the presence of a used wheel, etc etc. I really wanted an Ashford, as I had fallen in love with the wheel I learned on, so I did searches specifically for that brand but there were few to be seen in my price range. One day, I saw a listing for what the seller said was a 10-year-old Ashford for $150. The location was far but we were heading out of town for the Yule season so this person kindly offered to drive south and meet me along the highway outside a McDonalds. When I saw the wheel, I had some concerns. I knew right away that is was more than 10 years old. What she had meant was that it had been 10 years since she had purchased it. The wheel was obviously much older. The drive band was discoloured and the brake band was non-existent. There was no Ashford stamp to be seen anywhere on the body of it and upon examination, I noticed that one of the plastic brackets meant to hold the flyer was snapped in half. 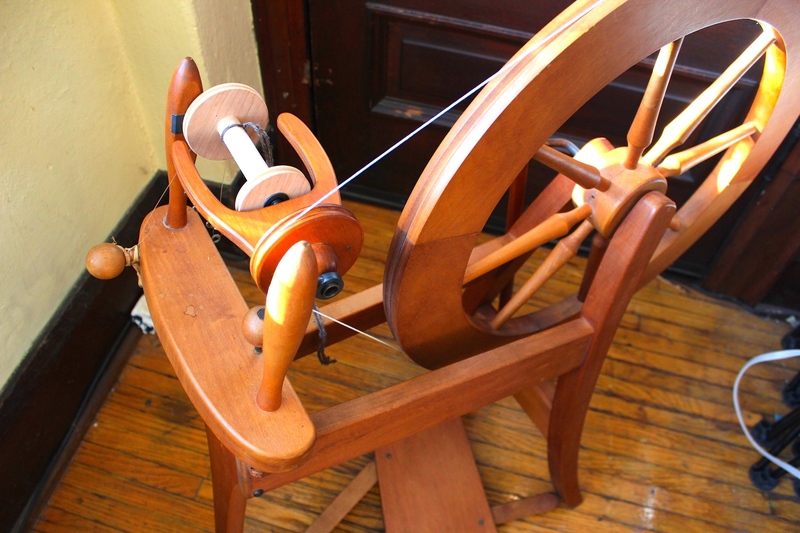 Upon using the treadle, the movement was smooth and easy. The wheel had no warp to be seen and all the moving bits and pieces seemed to be in good condition, just aged. This made sense as she told me it had been kept in a living room at a constant temperature rather than in a basement or attic where it likely would have sustained damage over time. Due to the snapped bracket, the seller dropped the price to $100. In the pictures I had seen, the bracket had been there so we both assumed it had broken during transit. The seller was amazing. She gave me her contact information to be in touch if I found I couldn’t fix the bracket. She said to let her know and she would meet me again, reimburse the money and take the wheel back. So, long story short….I bought the wheel and we continued on to Ottawa. Over our Christmas holidays, I took the wheel into two shops so that it could be examined by a couple of people who were more knowledgeable about wheels than I.
KnitKnackers in Smiths Falls, Ontario – It was on the way, so we stopped there right after buying the wheel. Wabi-Sabi in Ottawa, Ontario – This is second place I took my wheel. They specialize in Ashford wheels and their accessories so this seemed to be the perfect place to take it. They were incredibly helpful and the store is fantastic! Lots of yarn and roving to choose from! I pointed out the broken bracket and they just happened to have a box of extra brackets in-store! Plus an Ashford accessory kit with new bands and all the extra little bits I may need to replace over time as I start spinning. I was so excited! 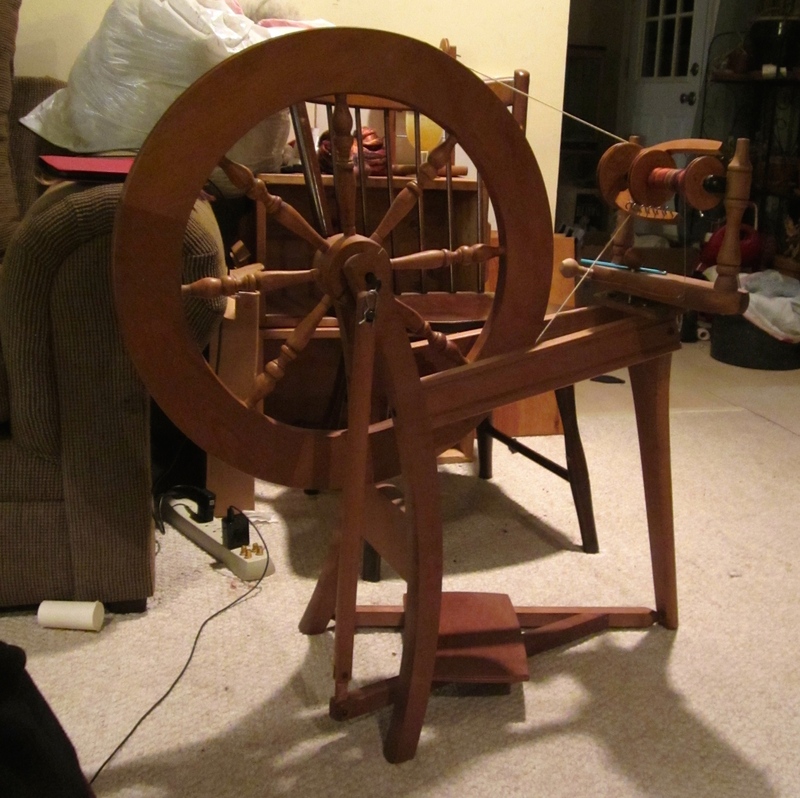 By Christmas, I had a functioning spinning wheel and I haven’t looked back!! And here she is! Introducing….Maddy (Madeleine)! Next postNewbie knitting: Jumping in Headfirst! !